After the post 2nd round media scrum in the ladies locker room...eh, that didn't sound right. 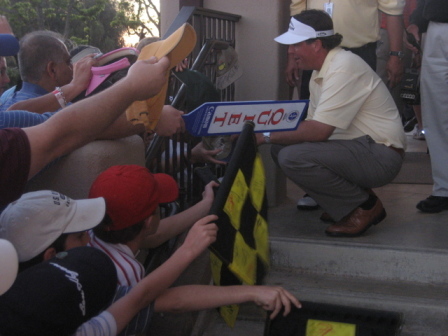 Anyway, after meeting with TV and print folks who burned off their chicken and potato media room lunch by coming up the hill to Riviera's clubhouse, Phil Mickelson easily could have taken a right turn down a hallway and headed toward the locker room. Instead, he announced his intention to sign autographs for 15-20 minutes, where around 50 people (mostly very young boys) were waiting in near darkness to get various items signed. Pretty classy.